I think it’s important to brag about any project that you manage to take from idea to completion. Many people (myself included) have a ton of ideas, few of which become something, and even fewer of which are actually finished and out there. So you should take any opportunity you get to shout out anything you’ve completed. Built a website? Cool. Remodeled your kitchen? Nice. Wrote a short story? Awesome. Get out there and tell people! I know the feeling of wanting to start something new every day just to forget about any mistakes you might have made in the previous day. It’s all about start, start, start. It’s never about finish, finish, finish. I guess sometimes we feel like “new” is better than “old” even if that “old” thing has potential. Without further ado, these are three major projects that I managed to complete in late 2015 and early 2016. They’re not much, but hey, they’re mine! 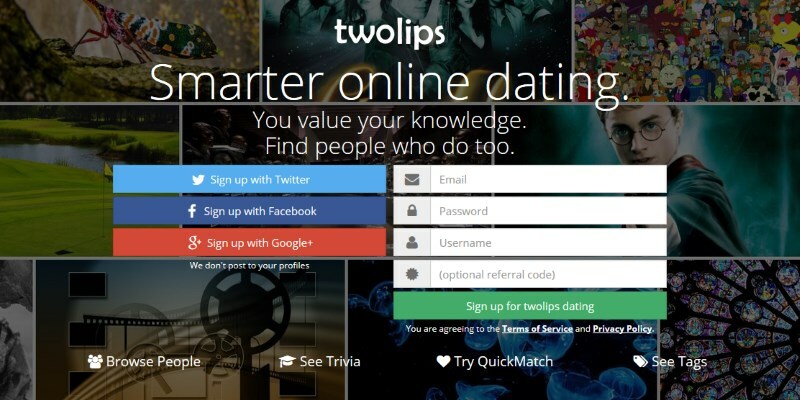 Twolips Dating is an online dating community aimed at those who want to find others based on their knowledge and skills. Find yourself attracted to someone really good at math? Awesome. Find people in the community who have answered a ton of math related trivia questions and quizzes. Sign up for free. Or just check out the blog to follow updates until you’re ready to start. 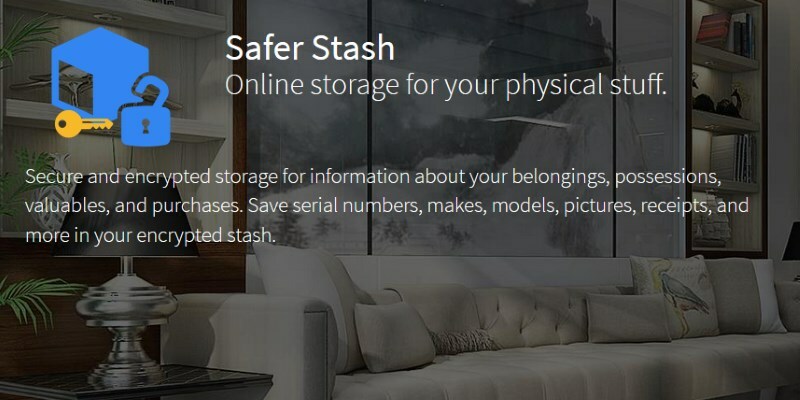 Safer Stash is an online encrypted virtual storage for your physical stuff. The image above does a good idea of succinctly describing it. Think of it as an online backup for receipts and images of your expensive belongings so that you’re protected in the event of a loss or other need. Sign up for free. Buzzwords are the worst. The absolute worst. They seem to be something that some higher up read about and decided to preach to his or her employees. Inevitably the buzzwords will end up on job requirements (even if the job has nothing to do with that buzzword) or talked about endlessly during job proposals and interviews. Honestly, it’s a huge red flag if someone repeats a certain methodology, process, or philosophy without justifying the context. “Agile” is just one such buzzword that seems to be really misunderstood and misapplied. What is this “Agile” thing? Supposedly its a software development methodology designed to react to a faster paced and rapidly changing form of software construction. Perhaps your requirements are in flux, or your customers don’t really know what they want until they see something in development, or you’re just really interested in that “scrum” word you keep hearing about on various tech blogs. Regardless, you really want in on that sweet, sweet Agile action. You hire some scrum masters, software engineers (remote is OK), QA engineers, technical writers, and business analysts. You setup a scrum board. You preach the tales of development sprints, user stories, and research spikes. You do all the things that you learned during your 2-day Agile bootcamp in Silicon Valley. Oh man, you’re on a roll you think to yourself. There’s no way a project can fail if I know of all the problems in our daily standups! Over time, some cracks start to appear in your process. Why are we revisiting a piece of code from three sprints ago? What do you mean you didn’t put in proper error handling and documentation? You had to meet your sprint deadline (which includes development + deployments + QA + code review + documentation + user acceptance). There’s no time for “clean code” and algorithms that “make sense.” Just get that stuff checked in and commit to your next sprint, damn it! Maybe it’s a cultural thing. Maybe it isn’t the Agile process at fault here. Maybe you’re just misusing it. Agile is a process with many faces. There are a ton of variations, all or none of which may apply to whatever project you have on hand. The lesson here is that you shouldn’t mass apply any one Agile methodology to your project without careful consideration of what the project is, what the project’s goals are, and how the people on the project like to work. Take some time to analyze these facets and build a process around your projects, cultures, and environments. Just because some other organization saw a billion percent increased revenue after adopting the most recent buzzwords doesn’t mean that the exact same process will yield the exact same results for you. Some time ago, I created an Ubuntu virtual machine in Azure using a password-based login. Over time, I got annoyed with having to enter the password each time I logged in, so I decided to switch over to using SSH public keys. Unfortunately, the Azure documentation regarding such a scenario assumes only that you will be creating a new virtual machine from scratch to create a public key based login. Have no fear. I have figured out how to do this without having to recreate your virtual machine. Just press ENTER when asked where to store the file unless you really want to put it somewhere other than the default. In most cases, the default is fine. After you pick the location, enter a good password to unlock the private key when prompted during login. Enter your server’s password-based login when prompted to begin the copying process. I’ve written in the past about how to setup WordPress on an Azure App Service and about connecting that WordPress instance to MySQL in an Azure VM. While these articles do contain some useful information about setting up WordPress and its interaction with Azure services, I’ve come to the conclusion that WordPress simply doesn’t function as nicely when hosted on IIS. I tried debugging these issues for months including monitoring incoming traffic on the VM to diagnose MySQL connection timeouts but was ultimately unsuccessful in determining a solution. Actually, that’s not entirely accurate. I did come up with a solution. I stopped using WordPress on Azure App Services. I’ve spent some recent weeks building a cool new web site which exposes a lot of Dota 2 game data which may not be easily accessible to most players. You might be thinking, but I already use DotaBuff for all my Dota 2 needs! DotaBuff is great, but it doesn’t cover everything. For starters, the new Dota Database that I’ve created is useful to see some of the finer details regarding heroes, hero abilities, items, item abilities, cosmetic items for purchase in the store, and more. This includes details like spell and ability behaviors, which shops you can purchase an in game item, hero level progressions, cosmetic item sets, and even pro player autographs. The information for these specifics comes directly from the game files and the Valve provided Dota 2 web APIs. This page will give you a paged listing of all currently live league games. Some games will display blank data when still in the hero picks/bans phase. Each listing shows the league, the team names, elapsed times, spectator counts, series scores, team scores, player scores, player picks, team worth, and team XP. Click in to the listing to see all the live updated details for the match. When you click in to a live league game, you’ll see a page full of information about that game. Every 20 seconds, the page will refresh and show you the latest updates about the match. 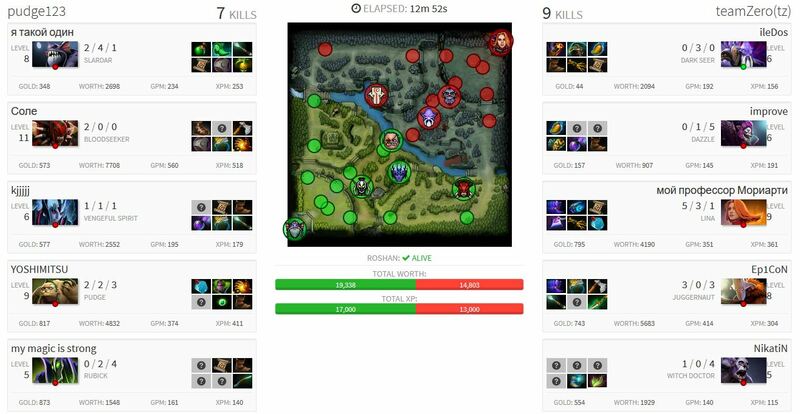 All data is provided by Valve through its Dota 2 league web API. At the top, you’ll first see the league and its details, team picks/bans, and some details about the match itself such as match id, series scores, spectator counts, and the duration of the game. Click any hero to go to the details page for that hero. In the middle, you’ll see the “meat” of the game such as individual player details, map positions, tower statuses, team worth, Roshan status, items purchased, and more. This is basically the section that you’ll want to pay attention to as the game progresses. And finally, near the bottom of the page, you’ll see a table which contains the overall status of every player in the game. This allows you to quickly sort and compare every player against each other with things like XP, kills, deaths, gold, and more. It’s a good way of determining which team is probably in the lead. Just keep in mind that player stats don’t necessarily indicate which team is winning. Interested in the heroes you can choose from in game? Want to know everything about them? Ever wonder what specific behaviors were attached to their abilities? Then this page is perfect for you.